Educational Resources for Illinois Birds! Hey IDNR...How do I Focus Binoculars? Find out what happens to wildlife during every month of the year with this 24-page activity book. The color-by-number pages will help students gain a realistic perspective on how these species actually appear. Targeted Grades: K-3. Permission to photocopy these pages is granted for use with students in the classroom. Activity book has coloring pages which contain information and activities about nocturnal species. Targeted Grades: K-6. Permission to photocopy these pages is granted for use with students in the classroom. 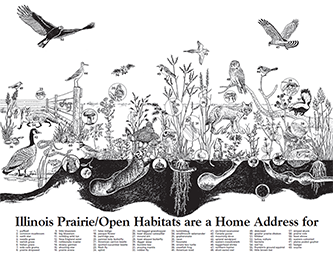 Activity book contains coloring pages for 18 bird species found in Illinois. Student activities and information are also included. Targeted Grades: 4-8. Permission to photocopy these pages is granted for use with students in the classroom. Activity book contains coloring pages and facts about the state symbols. Targeted Grades: K-6. Permission to photocopy these pages is granted for use with students in the classroom. Activity book contains coloring pages depicting 16 species of Illinois owls and hawks. Information and activities about these raptors are also included. Targeted Grades: K-8. Permission to photocopy these pages is granted for use with students in the classroom. 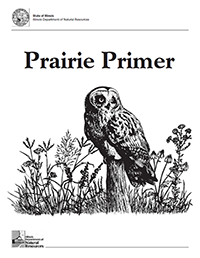 Students of grades 4-8 can learn about the ecology of Illinois' prairie habitats with this 32-page publication. The accompanying poster depicts the organisms that are discussed in the text. This activity book contains coloring pages of eight common wildlife species from our state.